Friends, what we have here is the most compelling argument for worker solidarity you will see all day. 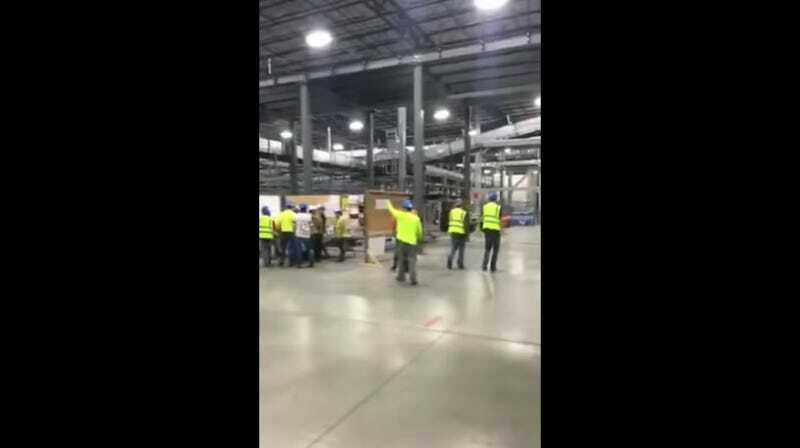 Earlier this week, Indianapolis welder Antoine Dangerfield was working for a contractor building a UPS facility when he caught the moment when over 100 workers walked off the job after a few of their coworkers were fired by a boss they say got racist. Or, in Dangerfield’s words, “They thought they was gonna play with these amigos, and they said, ‘We rise together, homie.’” Dangerfield then kept the camera rolling as he giddily gave the viewer a tour of the now-empty factory. Dangerfield was fired after posting the video online, where it’s been viewed by millions of people. He spoke to Jacobin and said that UPS initially offered him $250 to delete the video, but at that point, it had already achieved virality. The workers weren’t unionized, but they were apparently so fed up with constant prodding from a “racist safety guy,” that they left with their heads held high. “I just felt that power, man. It just felt good. They were walking out with their heads up, strong. It touched me. That’s why I was like, wow, this is beautiful. It was beautiful that they came together like that—stood up for themselves and not let that dude walk all over them,” Dangerfield told Jacobin. He says he thinks the video became so popular because it depicts people coming together and exercising their power as one. “We’re the ones, the workers—we make the heads get rich. Treating us lesser than isn’t even cool. We’re the reason the hub was getting built. Ain’t no owners out there in their hard hats. We’re the ones putting our life on the line. So you gotta respect us,” he said.